Rylee – Moments. Minutes. Memories…..
Our oldest Grandchild, Rylee, had her 5th birthday last month and she starts Kindergarten in just a few weeks. I can’t believe how fast time is going. We took her out to eat for her birthday…we ‘suggested’ Mexican food and she asked for Chicken Express…really? Keith tried to change her mind but she responded with ‘Papa, you know I like Chicken Express all day’. So, off we went to enjoy a birthday dinner with our 5 year old! We took her to Target to look for a new Barbie, but after searching all of the shelves there wasn’t one that she was interested in so off to Toys R Us we went. They had a larger selection so we searched every nook and cranny and finally found a ‘princess barbie’. Actually she is in a wedding dress, but she called her the princess. This particular barbie is dark skinned…not that that is a problem, but it sets up the rest of the story! Now she needed a Ken and since he comes in every outfit known to man there were plenty to choose from. She was looking hard when all of a sudden she pointed and said “I want that one, the one with the curly hair” Yep, you guessed it, he was dark skinned as well. (we had to laugh that she wanted them to be ‘matching’) However, he wasn’t dressed for a wedding. he had on shorts and a tank..so we had to find him a tux! We did some clothes changing in the car so they could ride home in their wedding attire! What a great time! 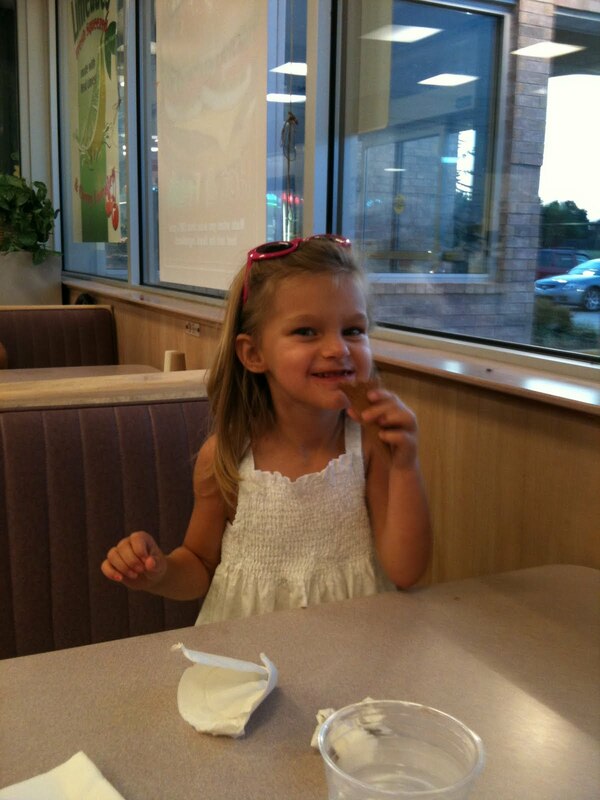 We made a quick stop at Braum’s had for some chocolate ice cream…oh yeah! We had a great time sharing this day with her! Love you Rylee Alisabeth! You are one special little girl!